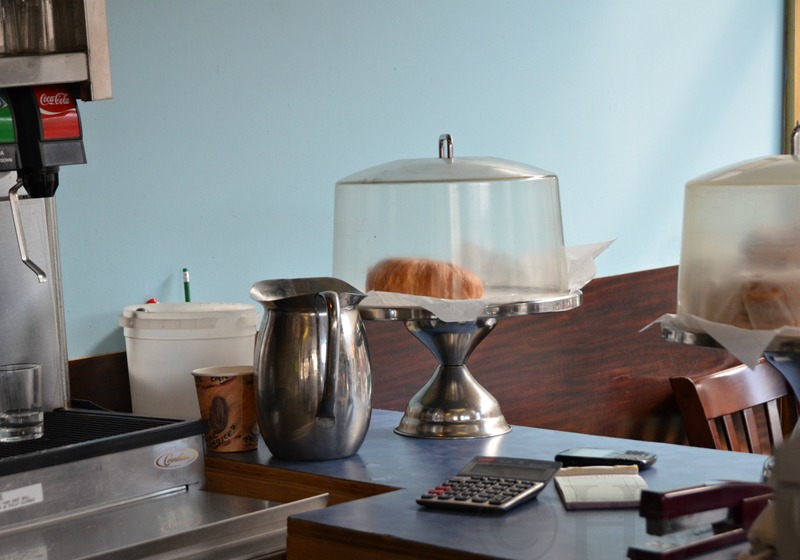 COFFEE SHOP STILL LIFE: Americana is the classic local coffee shop with the Coke machine, the cake tray bearing the last croissant, the classic pewter coffee shop water pitcher, the calculator to add the take-out order’s total. This little corner of Americana is the New Post Coffee Shop on Queens Blvd and 40th Street. It is comfort. Having stood still in time since the 1960’s, it is reassuring that the hectic pace of change can go away, just for that time you spend here. The classic ketchup bottle on the counter, those wonderful thick white coffee mugs, the cake trays with the plastic domes, the sizzle of the gridle, vinyl covered counter stools that twirl, laminate counters with plastic menus offering a wide variety of comfort food to make that awful boss, that annoying subway ride or that really bad day just go away. This entry was posted on October 3, 2012 by newyorkcityinthewitofaneye. It was filed under DAILY PHOTOS WITH STORIES OF NEW YORK CITY and was tagged with classic dinner, Coke, food, Hans Von Rittern, New Post Coffe Shop, New York City, Queens, restaurants.